Last night, Taylor and I met some of our friends at the park to play ultimate frisbee. The ground was wet, it was very humid, and it was sprinkling as we played, but it was still fun. Both times we've gone, there were two games in one night. With my "grandma hip" I only make it through one game; after that I just watch and talk to whoever happens to be on the bleachers with me. Jack the Dipper was really great! They make their own waffle cones (you can chose between plain or cinnamon) and they have so many choices of ice cream flavors. 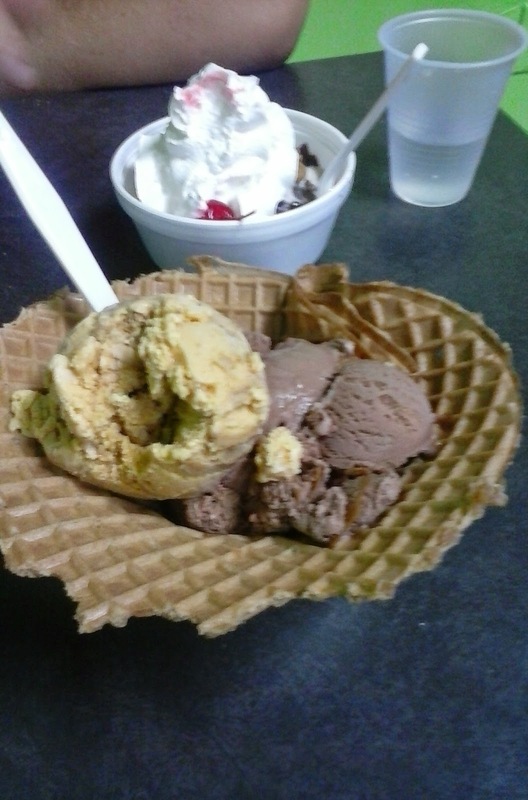 I ended up with a cinnamon waffle bowl with one scoop of spiced pumpkin pecan and one scoop of chocolate peanut butter. The pumpkin was absolutely FANTASTIC! I am going to be craving it for days! If you live in the area, I highly recommend Jack the Dipper.